Usually dorsal midline: Dermal sinus tracts usually are single and are found in the midline. However, there are reports of lateral, double, or multiple tracts occurring in various locations along the spine (3, 4, 5). Extension subcutaneous: Dermal sinus tracts are characterized by a tract lined by stratified squamous epithelium, extending from the skin surface through the various mesodermal layers (fascia, muscle, bone) (2). Usually penetrate dura: In most cases, dermal sinus tracts enter the dura to end within the thecal sac. In the thecal sac, they can attach to the conus medullaris, cauda equina, or filum terminale (1, 9, 16). Sometimes the tracts end in the epidural space or even in the underlying paravertebral soft tissue (3, 9). Due to the ascent of the conus medullaris during fetal life, the dermal sinus tract’s orifice, the tract’s point of entry into the dura, and its attachment to the conus are at different levels of the spine. May tether spinal cord: Dermal sinus tracts can cause a tethered cord syndrome (2) as a result of traction on the conus medullaris. As with other tethering lesions, an associated syringomyelia can exist (16). May have associated epidermoid or dermoid cyst: Approximately half of all dermal sinus tracts are accompanied by dermoid or epidermoid tumors. These inclusion tumors or cysts usually develop at the termination of the dermal sinus tracts but can occur anywhere along the tract between the skin and the neural tube (2, 16, 17). None: No gene mutation has been identified. 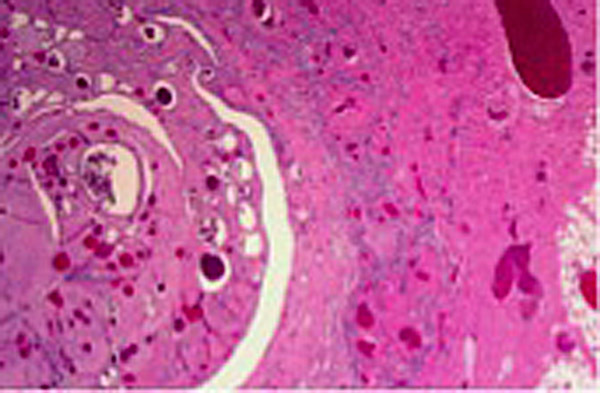 Various tissue elements within sinus tract: The histology of the dermal sinus tract may include fibrous tissue, fat, blood vessels, cartilage, as well as neural and meningeal tissue (11).